Be it the underground cities of Cappadocia, the stone age village on an Orkney island, or the caves of Mátala: I am fascinated by the places where people lived in prehistoric times. I love to see ancient tools and weapons, clay pottery and jewellery, I am impressed by paintings and carvings on rock. In England there are stone circles, megaliths and stone table portals – and I wanted to paint at least one of these stone age relics. So, we took part in a little tour to Lanyon Quoit during a vacation in Cornwall, where a gigantic stone slab rests on three stone pillars. All the boulders were from the last ice age, our tour guide Patrick explained. But we do not know when and how they were transported and erected. Was this portal the access to a sacred site or a burial place? Our little son Joel was curious and had many questions about why things were the way they were; my husband Klaus and I would have liked to answer them. But how does one talk about things of which nobody has any idea? “I read that women crawled backwards through this holed stone when they wanted to improve their fertility – and they did it ten times,” a tourist interjected, talking to the group, looking towards the rock next to the stone portal. Patrick shrugged his shoulders. “That may be, but it could just as well have been different,” he said objectively, but shook his head indignantly when another woman claimed she knew for sure that this rock slab was a highly energetically charged place. In the stone age it was here, she claimed, that a connection to the universe was established and oracles spoke. “No,” Patrick said, “we can only speculate about that 200 generations later – simply believe it or not. The colloquial name for Lanyon Quoit is ‘The Giant’s table’. That too is one of many ideas and would theoretically be a plausible option, wouldn’t it?” Everyone laughed at this idea except of Patrick. Given how unfathomable the stone age as a whole is, this stone table portal was never going to reveal its secret. While the small tour group continued to visit other sights in the area, I remained alone and painted my picture of Lanyon Quoit. It was nice to sit in the grass in the middle of the field, to imagine how important this now so lonely place had undoubtedly been many thousand years ago. Later I ran to the next village and took a bus back to the city. 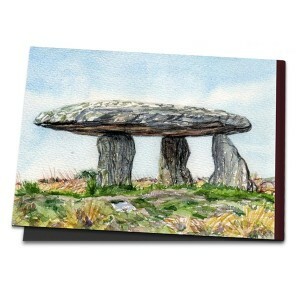 In the evening at the B&B I was amazed when Joel presented me a drawing of the Lanyon Quoit. He had three giants sitting at the stone table and cheerfully chomping away at a mammoth. Obviously, he had liked this view of the stone age best.